In December of 2013, the European Space Agency’s Gaia mission took to space. Since that time, this space observatory has been studying a billion astronomical objects – including stars, planets, comets, asteroids and galaxies – for the sake of creating the most precise 3D space catalog ever made. By the time the mission wraps up (later this year, barring extensions), it is expected to reveal some truly amazing things about our Universe. In fact, with the first release of its data, the Gaia probe revealed something that has gone completely unnoticed until now. While viewing Sirius, the brightest star in the night sky, Gaia revealed a stellar cluster that had previously been obscured by Sirius’ bright light. This cluster – now known as the Gaia 1 Cluster – is now available to the public thanks to a picture that was taken by an amateur astronomer from Germany. Given its brightness and the fact that it is visible from just about anywhere on the planet, Sirius has been known since antiquity, and was featured prominently in the astrological and astronomical traditions of many cultures. To the ancient Egyptians, the star was used to keep track of time and agriculture, since its return to the sky was linked to the annual flooding of the Nile. In Ancient Greek mythology, Sirius represented the eye of the Canis Major constellation. Along with Canis Minor, it formed the Great Dog that diligently followed Orion, the Hunter. In Chinese astronomy, the star is known as the star of the “celestial wolf” and lies in the Mansion of Jing. And when Ptolemy created his influential astronomical tract in the 3rd century CE (the Almagest), he used Sirius as the location for the globe’s central meridian. By the mid-19th century, astronomers determined that Sirius is actually a binary star system. Essentially, the star system consists of a main sequence white dwarf that is roughly two Solar masses and a white dwarf that is slightly more massive than our Sun. 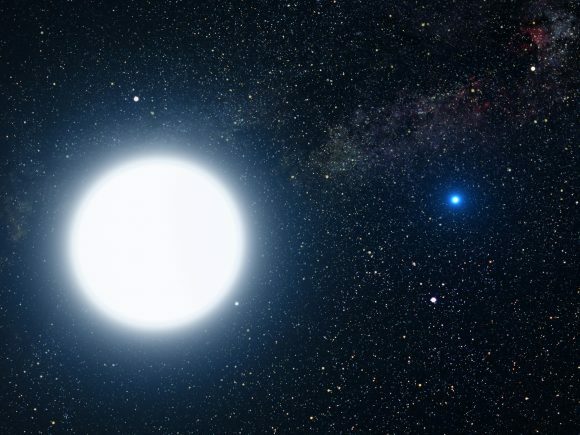 Sirius’ bright appearance means that astronomers have had plenty of light to study the star’s properties, but also causes it to outshine other celestial objects in its vicinity. However, in the course of counting the stars around Sirius, Gaia’s sophisticated instruments managed to detect the Gaia 1 Cluster for the first time. News of both this cluster and another newly-discovered one (the Gaia 2 Cluster) became public after the first release of Gaia data, which took place in September 2016. News of this discovery sent ripples through the astronomical community and has led to much research into this cluster and its companion. News of the discovery also prompted attempts to visually capture the cluster. Roughly a year ago, Harald Kaiser – an amateur astronomer from Karlsruhe, Germany – attended a public talk about the Gaia mission, where he learned about the Gaia 1 Cluster being spotted near Sirius. Kaiser then eagerly waited for the next clear night so he could find the cluster himself using his 30 cm telescope. 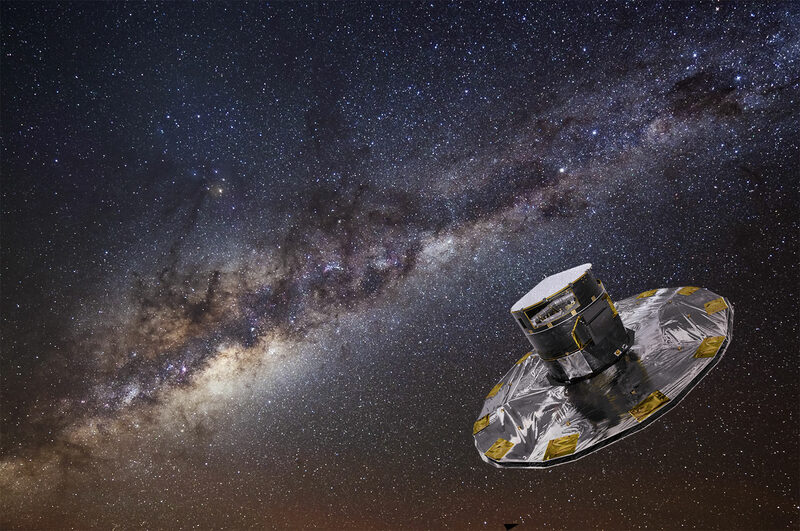 The ESA’s Gaia mission is currently on a five-year mission to map the stars of the Milky Way. Credit: ESA/ATG medialab; background: ESO/S. Brunier. After snapping a picture of Sirius and correcting for its bright glare, he was able to capture some of the brightest stars in the cluster. As you can see from the image he took (at top), the cluster lies slightly to the left of Sirius and shows a smattering of some of its largest and brightest stars. In addition to revealing the location of this cluster, Kaiser’s efforts are also part of a larger effort to capitalize on the Gaia mission’s progress. According to a study released in February of last year – led by Sergey Kopsov of Carnegie Melon University – Gaia 1 is a particularly massive cluster. In essence, it weighs in at an impressive 22,000 Solar Masses, is about 29 light-years (9 parsecs) in diameter, and is located 15,000 light years (4.6 kiloparsecs) from Earth. In addition to its size and the fact that it was previously undiscovered, it’s proximity also makes it an opportune target for future research. The announcement of this cluster has also caused a fair degree of excitement in the scientific community since it validates the capabilities of Gaia and serves as an example of the kinds of things it is expected to reveal. Astronomers are now looking forward to Gaia’s second data release (planned for April 25th) which is expected to provide even more possibilities for new and exciting discoveries. The Hubble Teams are giving away a few “gifts” to everyone to celebrate this silver anniversary — see below! The cluster is named after Swedish astronomer Bengt Westerlund who discovered the grouping in the 1960s. You can get access to larger versions of the image here at ESA’s Hubble website, or at NASA’s HubbleSite. And here’s a downloadable 25th anniversary gift for everyone: Hubble is offering a free ebook of 25 of Hubble’s most significant images, which can be found at this link or at iTunes. See a stunning gallery of all the ‘anniversary’ images that have been released by the Hubble teams over the last 25 years at this Flickr gallery. Brazilian astronomers have discovered some 300+ star clusters that were largely overlooked owing to sizable obscuration by dust. The astronomers, from the Universidade Federal do Rio Grande do Sul, used data obtained by NASA’s WISE (Wide-Field Infrared Survey Explorer) space telescope to detect the clusters. “WISE is a powerful tool to probe … young clusters throughout the Galaxy”, remarked the group. The clusters discovered were previously overlooked because the constituent stars are deeply embedded in their parent molecular cloud, and are encompassed by dust. Stars and star clusters can emerge from such environments. The group added that, “The present catalog of new clusters will certainly become a major source for future studies of star cluster formation.” Indeed, WISE is well-suited to identify new stars and their host clusters because infrared radiation is less sensitive to dust obscuration. The infrared part of the electromagnetic spectrum is sampled by WISE. An optical (DSS) and infrared (WISE) image of the same field. A cluster of young stars is not apparent in the optical (left) image owing to obscuration by dust. However, a young star cluster is readily apparent in the right image because dust obscuration is significantly less at infrared wavelengths. A new study by a team of astronomers highlights the discovery of numerous star clusters using WISE data (image credit: DSS/NASA/IPAC and assembly by D. Majaess). Historically, new star clusters were often identified while inspecting photographic plates imaged at (or near) visible wavelengths (i.e., the same wavelengths sampled by the eye). Young embedded clusters were consequently under-sampled since the amount of obscuration by dust is wavelength dependent. As indicated in the figure above, the infrared observations penetrate the dust by comparison to optical observations. The latest generation of infrared survey telescopes (e.g., Spitzer and WISE) are thus excellent instruments for detecting clusters embedded in their parent cloud, or hidden from detection because of dust lying along the sight-line. The team notes that, “The Galaxy appears to contain 100000 open clusters, but only some 2000 have established astrophysical parameters.” It is hoped that continued investigations using WISE and Spitzer will help astronomers minimize that gap. The discoveries are described in a new study by D. Camargo, E. Bica, and C. Bonatto that is entitled “New Glactic embedded cluster and candidates from a WISE survey“. The study has been accepted for publication, and will appear in a forthcoming issue of the journal New Astronomy. For more information on Galactic star clusters see the Dias et al. catalog, the WEBDA catalog, or the Star Clusters Young & Old Newsletter. Thanks to K. MacLeod for the title suggestion. The WISE (Wide-field Infrared Survey Explorer) space telescope was used to discover numerous star clusters (image credit: NASA). We’ve discovered dozens of so-called “hypervelocity stars” — single stars that break the stellar speed limit. But today astronomers multiplied the number of these ‘runaway’ stars by hundreds of thousands. The Virgo Cluster galaxy, M87, has ejected an entire star cluster, throwing it toward us at more than two million miles per hour. “Astronomers have found runaway stars before, but this is the first time we’ve found a runaway star cluster,” said lead author Nelson Caldwell of the Harvard-Smithsonian Center for Astrophysics, in a press release. About one in a billion stars travel at a speed roughly three times greater than our Sun (which clocks in at 220 km/s with respect to the galactic center). At a speed that fast, these stars can easily escape the galaxy entirely, traveling rapidly throughout intergalactic space. But this is the first time an entire star cluster has broken free. What would cause an entire cluster — hundreds of thousands of stars packed together a million times more closely than in the neighborhood of our Sun — to reach such a tremendous speed? Single hypervelocity stars have puzzled astronomers for years. But by observing their speed and direction, astronomers can trace these stars backward, finding that some began moving quickly in the Galactic Center. Here, an interaction with the supermassive black hole can kick a star away at an alarming speed. Another option is that a supernova explosion propelled a nearby star to a huge speed. Caldwell and colleagues think M87 might have two supermassive black holes at its center. The star cluster wandered too close to the pair, which picked off many of the cluster’s outer stars while the inner core remained intact. The black holes then acted like a slingshot, flinging the cluster away at a tremendous speed. The star cluster is moving so fast it should soon by sailing into intergalactic space. It may already be, but its distance remains unknown. Velocities of stars, globular clusters and galaxies toward Virgo. HVGC-1 is the marked extreme left outlier. Image Credit: Caldwell et al. The team found the globular cluster — dubbed HVGC-1 — with a stroke of luck. They had been analyzing 2,500 globular cluster candidates for years. While a computer algorithm automatically calculated the speed of every cluster, any oddity was analyzed by hand. Over 1,000 candidates have measured velocities between 500 and 3000 km/s. These speeds are typical for Virgo Cluster members. But HVGC-1 has a radial velocity of -1026 km/s. “This is the most negative, bulk velocity ever measured for an astronomical object not orbiting another object,” writes Caldwell. “We didn’t expect to find anything moving that fast,” said coauthor Jay Strader of Michigan State University. Future measurements pinpointing the exact distance to the globular cluster will help shed light on its exact origins. The paper will be published in The Astrophysics Journal Letters and is available for download here. For those of us who practice amateur astronomy, we’re very familiar with the 150 light-year distant Hyades star cluster – one of the jewels in the Taurus crown. We’ve looked at it countless times, but now the NASA/ESA Hubble Space Telescope has taken its turn observing and spotted something astronomers weren’t expecting – the debris of Earth-like planets orbiting white dwarf stars. Are these “burn outs” being polluted by detritus similar to asteroids? According to researchers, this new observation could mean that rocky planet creation is commonplace in star clusters. So what makes this an uncommon occurrence? Research tells us that all stars are formed in clusters, and we know that planets form around stars. However, the equation doesn’t go hand in hand. Out of the hundreds of known exoplanets, only four are known to have homes in star clusters. As a matter of fact, that number is a meager half percent, but why? As a rule, the stars contained within a cluster are young and active. They are busy producing stellar flares and similar brilliant activity which may mask signs of emerging planets. This new research is looking to the “older” members of the cluster stars – the grandparents which may be babysitting. To locate possible candidates, astronomers have employed Hubble’s Cosmic Origins Spectrograph and focused on two white dwarf stars. Their return showed evidence of silicon and just slight levels of carbon in their atmospheres. This observation was important because silicon is key in rocky materials – a prime ingredient on Earth’s list and other similar solid planets. This silicon signature may have come from the disintegration of asteroids as they wandered too close to the stars and were torn apart. A lack of carbon is equally exciting because, while it helps shape the properties and origins of planetary debris, it becomes scarce when rocky planets are formed. This material may have formed a torus around the defunct stars which then drew the matter towards them. Ring around the rosie? You bet. This leftover material swirling around the white dwarf stars could mean that planet formation happened almost simultaneously as the stars were born. At their collapse, the surviving gas giants may have had the gravitational “push” to relocate asteroid-like bodies into “star-grazing orbits”. This image shows the region around the Hyades star cluster, the nearest open cluster to us. The Hyades cluster is very well-studied due to its location, but previous searches for planets have produced only one. A new study led by Jay Farihi of the University of Cambridge, UK, has now found the atmospheres of two burnt-out stars in this cluster — known as white dwarfs — to be “polluted” by rocky debris circling the star. What of future plans? According to Farihi and the research team, by continuing to observe with methods like those employed by Hubble, they can take an even deeper look at the atmospheres around white dwarf stars. They will be searching for signs of solid planet “pollution” – exploring the white dwarf chemistry and analyzing stellar composition. Right now, the two “polluted” Hyades white dwarfs are just a small segment of more than a hundred future candidates which will be studied by a team led by Boris Gansicke of the University of Warwick in England. Team member Detlev Koester of the University of Kiel in Germany is also contributing by using sophisticated computer models of white dwarf atmospheres to determine the abundances of various elements that can be traced to planets in the Hubble spectrograph data. Original Story Source: Hubble News Release. It takes time to understand the life of stars. A star like our Sun takes tens of millions of years to form, and so much like archeologists who reconstruct ancient cities from shards of debris strewn over time, astronomers must reconstruct the birth process of stars indirectly, by observing stars in different stages of the process and inferring the changes that take place. One of the best places to study the lives of stars is in star clusters. These regions that are rich with young stars provide astronomers much information that is relevant to the study of stars in general, but within a cluster, stars can form during a wide range of time, as a new study of the star cluster named Cep OB3b has shown. “By studying nearby massive young clusters like Cep OB3b, we can gain a greater understanding of the environments out of which planets form,” said Thomas Allen from the University of Toledo, who is one of the authors of the new paper. Located in the northern constellation of Cepheus, CepOB3b is similar in some ways to the famous cluster found in the Orion Nebula. But unlike the Orion Nebula, there is relatively little dust and gas obscuring our view of Cep OB3b. Its massive, hot stars have blown out cavities in the gaseous cloud with their intense ultraviolet radiation which mercilessly destroys everything in its path. Cep OB3b may show us what the Orion Nebular Cluster will look like in the future. Allen and an international team of astronomers have found that the total number of young stars in the cluster is as high as 3,000. Infrared observations of the stars from the NASA Spitzer satellite show about 1,000 stars that are surrounded by disks of gas and dust from which solar systems may form. As the stars age, the disks disappear as the dust and gas get converted into planets or are dispersed into space. But these observations pointed to a new mystery. Although the stars in Cep OB3b are thought to be about three million years old, in some parts of the cluster most of the stars had lost their disks, suggesting that the stars in those parts were older. This suggests that the cluster is surrounded by older stars, potential relics of previous clusters that have since expanded and dispersed. To search for evidence for these relic clusters, Allen used the Mosaic camera on the 0.9 meter telescope at Kitt Peak National Observatory to observe wide field images of CepOB3b. These images show hot gas and its interaction with the stars and permit the team to study a curious cavity in the gas for evidence of older, yet still juvenile, stars that have lost their disks of gas and dust. With these data, the team is searching for the previous generations of star formation in the region surrounding Cep OB3b, and piecing together the history of star formation in this magnificent region. When finished, this may provide clues how previous generations may have influenced the current generation of stars and planets forming in Cep OB3b. Greetings, fellow SkyWatchers! Are you ready for a week filled with alternative astronomical observing studies? If so, you’ll enjoy looking at some unusual stars and star clusters. If you want to keep things cool, then come along as we mine for lunar ice. Feeling a bit more lazy? Then kick back and enjoy the Delta Aquarid meteor shower or just step out after sunset and enjoy a splendid conjunction! It’s all here… Just head outside! Monday, July 23 – Tonight we’ll launch our imaginations as we view the area around Mare Crisium and have a look at this month’s lunar challenge – Macrobius. You’ll find it just northwest of the Crisium shore. Spanning 64 kilometers in diameter, this Class I impact crater drops to a depth of nearly 3600 meters – about the same as many of our earthly mines. Its central peak rises up 1100 meters, and may be visible as a small speck inside the crater’s interior. Be sure to mark your lunar challenges and look for other features you may have missed before! As we know most stars begin life in stellar nurseries and end life either alone or in very small groups as doubles or multiple stars. Tonight we can have a look at a group of young stars beginning their stellar evolution and end with an old solitary elder preparing to move on to an even “higher realm.” Open cluster IC 4665 (Right Ascension: 17 : 46.3 – Declination: +05 : 43) is easily detected with just about any optical aid about a finger-width north-northeast of Beta Ophiuchi. Discovered by Philippe Loys de Cheseaux in the mid-1700s, this 1400 light-year distant cluster consists of about 30 mixed magnitude stars all less than 40 million years of age. Despite its early discovery, the cluster did not achieve broad enough recognition for Dreyer to include it in the late 19th century New General Catalog and it was later added as a supplement to the NGC in the Index Catalog of 1908. Be sure to use low power to so see all of this large group. About three finger-widths north-northeast of IC 4665 is a study that did make Dreyer’s catalogue – NGC 6572 (Right Ascension: 18 : 12.1 – Declination: +06 : 51). This 9th magnitude planetary is very small – but intense. Like the “Cat’s Eye” in Draco, and NGC 6210 in Hercules, this planetary can take a lot of magnification. Those with large scopes should look for a small, round, blue inner core encased is a faint shell. A challenge to find? You bet. Worth the work? Sometimes working for something makes it all the more fun! With plenty of Moon to explore tonight, why don’t we try locating an area where many lunar exploration missions made their mark? Binoculars will easily reveal the fully disclosed areas of Mare Serenitatis and Mare Tranquillitatis, and it is where these two vast lava plains converge that we will set our sights. Telescopically, you will see a bright “peninsula” westward of where the two conjoin which extends toward the east. Just off that look for bright and small crater Pliny. It is near this rather inconspicuous feature that the remains Ranger 6 lie forever preserved where it crashed on February 2, 1964. Unfortunately, technical errors occurred and it was never able to transmit lunar pictures. Not so Ranger 8! On a very successful mission to the same relative area, this time we received 7137 “postcards from the Moon” in the last 23 minutes before hard landing. On the “softer” side, Surveyor 5 also touched down near this area safely after two days of malfunctions on September 10, 1967. Incredibly enough, the tiny Surveyor 5 endured temperatures of up to 283 degrees F, but was able to spectrographically analyze the area’s soil… And by the way, it also managed to televise an incredible 18,006 frames of “home movies” from its distant lunar locale. Wednesday, July 25 – Today in 1971, Apollo 15 was launched on its way towards the Moon, and we’ll continue our celebration of space exploration and walk on the Moon where the first man set foot. For SkyWatchers, the dark round area you see on the northeastern limb is Mare Crisium and the dark area below that is Mare Fecunditatis. Now look mid-way on the terminator for the dark area that is Mare Tranquillitatis. At its southwest edge, history was made. For telescope users, the time is now to power up! See if you can spot small craters Armstrong, Aldrin and Collins just east. Even if you cannot, the Apollo 11 landing area is about the same distance as Sabine and Ritter are wide to the east-southeast. Even if you don’t have the opportunity to see it tonight, take the time during the next couple of days to point it out to your children, grandchildren, or even just a friend… The Moon is a spectacular world and we’ve been there! Delta Ophiuchi is 170 light-years from us, while Epsilon is 108 – but look at the magnificent field they share. Stars of every spectral type are in an area of sky which could easily be covered by a small coin held at arm’s length. Enjoy this fantastic field – from the hot, blue youngsters to the old red giants! Our first order of business will be to identify crater Albategnius. Directly in the center of the Moon is a dark floored area known as Sinus Medii. South of it will be two conspicuously large craters – Hipparchus to the north and ancient Albategnius to the south. Trace along the terminator toward the south until you have almost reached its point (cusp) and you will see a black oval. This normal looking crater with the brilliant west wall is equally ancient crater Curtius. Because of its high southern latitude, we shall never see the interior of this crater – and neither has the Sun! It is believed that the inner walls are quite steep and that Curtius’ interior has never been illuminated since its formation billions of years ago. Because it has remained dark, we can speculate that there may be “lunar ice” pocketed inside its many cracks and rilles that date back to the Moon’s formation! Because our Moon has no atmosphere, the entire surface is exposed to the vacuum of space. When sunlit, the surface reaches up to 385 K, so any exposed “ice” would vaporize and be lost because the Moon’s gravity cannot hold it. The only way for “ice” to exist would be in a permanently shadowed area. Near Curtius is the Moon’s south pole, and the Clementine spacecraft’s imaging showed around 15,000 square kilometers in which such conditions could exist. So where did this “ice” come from? The lunar surface never ceases to be pelted by meteorites – most of which contain water ice. As we know, many craters were formed by just such impacts. Once hidden from the sunlight, this “ice” could remain for millions of years! Friday, July 27 – Tonight let’s skip the Moon and take a look at an astounding system called 36 Ophiuchi, located about a thumb’s width southeast of Theta. 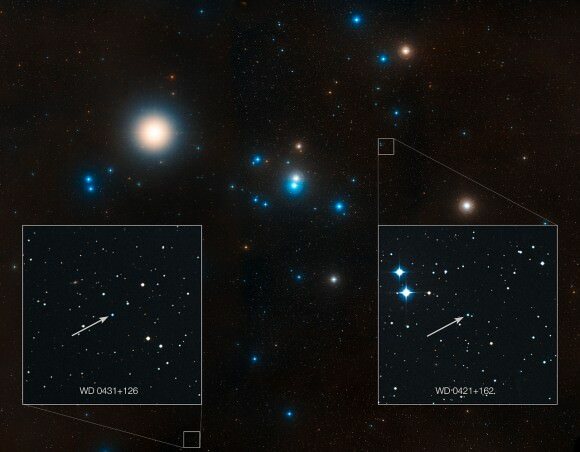 Situated in space less than 20 light-years from Earth, even small telescopes can split this pair of 5th magnitude K type giants very similar to our own Sun, and larger telescopes can also pick up the C component as well. 36 Ophiuchi B is also known as system 544…because it has what could very likely be a planet in a habitable zone! Now we’ll have a look at a beautifully contrasting pair of stars – Zeta 1 and 2 Scorpii. You’ll find them a little less than a handspan south-southeast of Antares and at the western corner of the J of the constellation’s shape. Although the two Zetas aren’t a true physical pair, they are nonetheless interesting. The easternmost, orange sub-giant Zeta 2 appears far brighter for a reason… It’s much closer at only 155 light-years away. But, focus your attention on western Zeta 1. It’s a blue supergiant that’s around 5700 light-years away and shines with the light of 100,000 suns and exceeds even Rigel in sheer power! The colorful pair is easily visible as two separate stars to the unaided eye, but a real delight in binoculars or a low power telescope field. Check them out tonight! Saturday, July 28 – Tonight let’s continue our studies of the lunar poles by returning to previous study crater Plato. North of Plato you will see a long horizontal area with a gray floor – Mare Frigoris. North of it you will note a double crater. This elongated diamond-shape is Goldschmidt and the crater which cuts across its western border is Anaxagoras. The lunar north pole isn’t far from Goldschmidt, and since Anaxagoras is just about one degree outside of the Moon’s theoretical “arctic circle” the lunar sun will never go high enough to clear the southernmost rim. On March 5, 1998, NASA announced that Lunar Prospector’s neutron spectrometer data showed that water ice had been discovered at both lunar poles. The first results showed the ice was mixed in with lunar regolith (soil, rocks and dust), but long term data confirmed near pure pockets hidden beneath about 40 cm of surface material – with the results being strongest in the northern polar region. It is estimated there may be as much as 6 trillion kg (6.6 billion tons) of this valuable resource! If this still doesn’t get your motor running, then realize that without it, we could never establish a manned lunar base because of the tremendous expense involved in transporting our most basic human need – water. The presence of lunar water could also mean a source of oxygen, another vital material we need to survive! And for returning home or voyaging further, these same deposits could provide hydrogen which could be used as rocket fuel. So as you view Anaxagoras tonight, realize that you may be viewing one of mankind’s future “homes” on a distant world! Now grab a comfortable seat because the Delta Aquarid meteor shower reaches its peak tonight. It is not considered a prolific shower, and the average fall rate is about 25 per hour – but who wouldn’t want to take a chance on observing a meteor about every 4 to 5 minutes? These travelers are considered to be quite slow, with speeds around 24 kilometers per second and are known to leave yellow trails. One of the most endearing qualities of this annual shower is its broad stream of around 20 days before and 20 days after peak. This will allow it to continue for at least another week and overlap the beginning stages of the famous Perseids. Sunday, July 29 – Tonight let’s take an entirely different view of the Moon as we do a little “mountain climbing!” The most outstanding feature on the Moon will be the emerging Copernicus, but since we’ve delved into the deepest areas of the lunar surface, why not climb to some of its peaks? Using Copernicus as our guide, to the north and northwest of this ancient crater lie the Carpathian Mountains, ringing the southern edge of Mare Imbrium. As you can see, they begin well east of the terminator, but look into the shadow! Extending some 40 kilometers beyond the line of daylight, you will continue to see bright peaks – some of which reach 2072 meters high! When the area is fully revealed tomorrow, you will see the Carpathian Mountains eventually disappear into the lava flow that once formed them. Continuing onward to Plato, which sits on the northern shore of Imbrium, we will look for the singular peak of Pico. It is between Plato and Mons Pico that you will find the scattered peaks of the Teneriffe Mountains. It is possible that these are the remnants of much taller summits of a once stronger range, but only around 1890 meters still survives above the surface. Time to power up! Lather, rinse and repeat until you know these by heart… To the west of the Teneriffes, and very near the terminator, you will see a narrow series of hills cutting through the region west-southwest of Plato. This is known as the Straight Range – Montes Recti – and some of its peaks reach up to 2072 meters. Although this doesn’t sound particularly impressive, that’s over twice as tall as the Vosges Mountains in central Europe and on the average very comparable to the Appalachian Mountains in the eastern United States. Not bad! Now head about a palm’s width east of our previous study star – Zeta Scorpii – for lovely Theta. Named Sargas, this 1.8 magnitude star resides around 650 light-years distant in a very impressive field of stars for binoculars or a small telescope. While all of these are only optical companions, the field itself is worth a look – and worth remembering for the future. About three fingerwidths north is true double Lambda Scorpii, also known as Shaula (The Sting). As the brightest known star in its class, 1.6 magnitude Lambda is a spectroscopic binary which is also a variable of the Beta Canis Majoris type, changing ever so slightly in little more than 5 hours. Although we can’t see the companion star, nearby is yet another that will make learning this starhop “marker” worth your time. Star clusters are wonderful test beds for theories of stellar formation and evolution. One of the key roles they play is to help astronomers understand the distribution of stellar masses as stars form (in other words, how many high mass stars versus intermediate and low mass stars), known as the Initial Mass Function (IMF). One of the problems is that this is constantly evolving away from the initial distribution as stars die or are ejected from the cluster. As such, understanding these mechanisms is essential for astronomers looking to backtrack from the current population to the IMF. To assist in this goal, astronomers led by Vasilii Gvaramadze at the University of Bonn in Germany are engaged in a study to search young clusters for stars in the process of being ejected. In the first of two studies released by the team so far, they studied the cluster associated with the famous Eagle Nebula. This nebula is well known due to the famous “Pillars of Creation” image taken by the aging Hubble Space Telescope which shows towers of dense gas currently undergoing star formation. Two main methods exist for discovering stars on the lam from their birthplace. The first is to examine stars individually and analyze their motion in the plane of the sky (proper motion) along with their motion towards or away from us (radial velocity) to determine if a given star has sufficient velocity to escape the cluster. While this method can be reliable, it suffers because the clusters are so far away, even though the stars could be moving at hundreds of kilometers per second, it takes long periods of time to detect it. Instead, the astronomers in these studies search for runaway stars by the effects they have on the local environment. Since young clusters contain large amounts of gas and dust, stars plowing through it will create bow shocks, similar to those a boat makes in the ocean. Taking advantage of this, the team searched the Eagle Nebula cluster for signs of bow shocks from these stars. Searching images from several studies, the team found three such bow shocks. The same method was used in a second study, this time analyzing a lesser known cluster and nebula in Scorpius, NGC 6357. This survey turned up seven bow shocks of stars escaping the region. In both studies, the team analyzed the spectral types of the stars which would indicate their mass. Simulations of nebulae suggested that the majority of ejected stars are given their initial kick as they have a close pass to the center of a cluster where the density is the highest. Studies of clusters have shown that their centers are often dominated by massive O and B spectral type stars which would mean that such stars would be preferentially ejected. These two studies have helped to confirm that prediction as all of the stars discovered to have bow shocks were massive stars in this range. While this method is able to find runaway stars, the authors note that it is an incomplete survey. Some stars may have sufficient velocity to escape, but still fall under the local sound speed in the nebula which would prevent them from creating a bow shock. As such, calculations have predicted that roughly 20% of escaping stars should create detectable bow shocks. Understanding this mechanism is important because it is expected to play the dominant role in the evolution of the mass distribution of clusters early in their life. An alternative method of ejection involves stars in a binary orbit. If one star becomes a supernova, the sudden mass loss suddenly decreases the gravitational force holding the second star in orbit, allowing it to fly away. However, this method requires that a cluster at least be old enough for stars to have evolved to the point they explode as supernova, delaying this mechanism’s importance until at least that point and allowing the gravitational sling-shot effects to dominate early on. Who can shine the brightest in the Large Magellanic Cloud? A brilliant cluster of stars, open cluster NGC 2100 shines brightly, competing with the nearby Tarantula Nebula for bragging rights in this image from ESO’s New Technology Telescope (NTT). Observers perhaps often overlook NGC 2100 because of its close proximity to the impressive Tarantula. The glowing gas of the Tarantula Nebula even tries to steal the limelight in this image — the bright colors here are from the nebula’s outer regions, and is lit up by the hot young stars that lie within the nebula itself. But back to the star cluster — this brilliant star cluster is around 15 million years old, and located in the Large Magellanic Cloud, a nearby satellite galaxy of the Milky Way. An open cluster has stars that are relatively loosely bound by gravity. These clusters have a lifespan measured in tens or hundreds of millions of years, as they eventually disperse through gravitational interaction with other bodies. This new picture was created from exposures through several different color filters.The stars are shown in their natural colors, while light from glowing ionized hydrogen (shown here in red) and oxygen (shown in blue) is overlaid. See more info at the ESO website. It’s not Earth, Wind and Fire*, but light, wind and fire in this dramatic new image of the Small Magellanic Cloud (NGC 346) that will make you want to Keep Your Head to the Sky**. The light, wind and heat given off by massive, Mighty Mighty ** Shinging Star(s)** have dispersed the glowing gas within and around this star cluster, forming a surrounding wispy nebular structure that looks like a cobweb. As yet more stars form from lose matter in the area, they will ignite, scattering leftover dust and gas, carving out great ripples and altering the face of this lustrous object. But, That’s the Way of the World** in this open cluster of stars, that we just Can’t Hide Love** for. You’ll really get a Happy Feelin’** by looking at the zoomable image of the Small Magellanic Cloud, or see below for a video zooming into the region. The nebula containing this clutch of bright stars can really Sparkle **. It is known as an emission nebula, meaning that gas within it has been heated up by stars until the gas emits its own light, just like the neon gas used in electric store signs. This image was taken with the Wide Field Imager (WFI) instrument at the MPG/ESO 2.2-metre telescope at the La Silla Observatory in Chile. Images like this help astronomers Turn It Into Something Good** by helping to chronicle star birth and evolution, while offering glimpses of how stellar development influences the appearance of the cosmic environment over time. If you want more information about this image, you can Let Your Feelings Show** by visiting the ESO website.